Oak-apples are constructed of leaf buds that have been hijacked by a gall-wasp (Family Cynipidae) to surround a single gall-wasp larva located within a seed-like structure positioned at the center of the gall. The gall structure provides both a protective home and a food source for the developing gall-wasp larva. Cutting the gall open will reveal the gall's internal structure. In general, there are two groups of oak-apple galls: those with internal tissue composed of a mass of white fibers radiating from the central larval capsule, and those with tissue that strongly resembles the flesh of an apple; it is spongy and juicy. The so-called Large Empty Oak-Apple Gall is produced by the gall-wasp, Amphibolips quercusinanis (syn. A. inanis). Galls measures up to 2" in diameter and arise from leaf buds on scarlet and red oaks. The gall surface is light green and covered with purplish-red bumps. The internal structure of this gall is composed of white fibers radiating from the central seed-like gall chamber. Wasp larvae have chewing mouthparts; so what do the gall-wasp larvae eat? The inside of the gall chamber is lined with specialized cells called nutritive tissue which is constantly being replaced as it is consumed by the gall-wasp larva. Imagine lounging in a room with pizzas constantly emerging from the walls. As with all plant galls, oak-apple galls change their appearance once they reach "maturity;" the point where a mature gall-wasp emerges. In fact, oak-apples are racing towards completing their appointed task this season in the southern part of the state. They will soon dramatically change color from Granny Smith apple-green to caramel brown. The mature, brittle galls are called “empty” because the filaments eventually disintegrate leaving an empty gall husk. 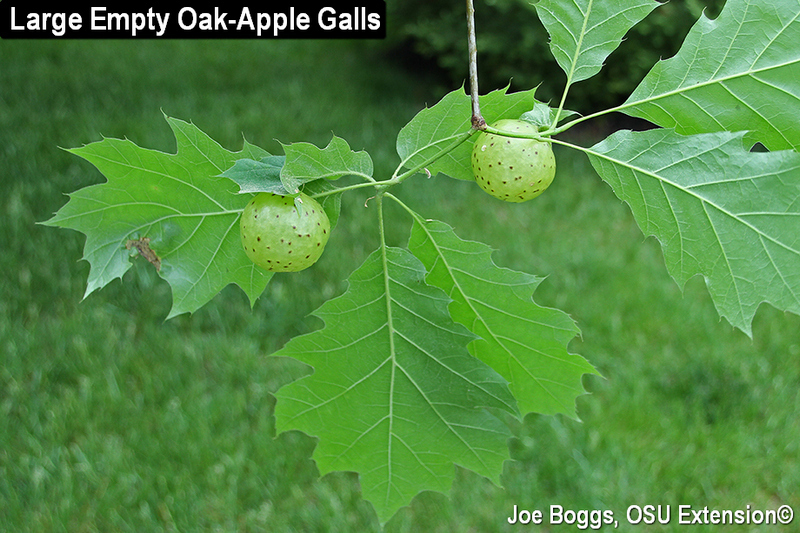 There are over 50 species of gall-wasps that are known to produce oak-apple galls in North America and there are probably at least 10-15 distinct species of oak-apple gall-wasps found in Ohio. Each type of oak-apple is produced by a different species of gall-wasp and their individual handiwork is so unique the galls alone can be used to identify the gall-wasp to species with actually seeing the wasp. For example, the Small Oak-Apple Gall is produced by the gall-wasp, Cynips clivorum. This gall forms on the underside of leaf blades as you can see in the images below. The gall surface is free of any spots or other markings; however, the internal structure is very similar to the Large Empty Oak-Apple Gall. As with the vast majority of plant galls, oak-apple galls cause no discernable harm to the overall health of their oak hosts. I believe they actually add ornamental value to their oak hosts, but I may be biased. Gall formation by wasps and other gall-making insects and mites is a complex and fascinating process that is not yet fully understood. Thus far, no researcher has ever produced a plant gall without the aid of a gall-maker. Part of the reason the gall-making process is so complex is because gall-makers produce chemicals that turn plant genes on and off at just the right time to direct gall growth. The resulting galls provide both a protective home and nourishment for the next generation of gall-maker. The chemicals exuded by gall-makers can only act upon "undifferentiated" meristematic plant cells. Under the influence of these chemicals, the meristematic cells that were originally destined to become flowers, stems, or leaves in the case of oak-apples, begin marching to a different drummer. Once the errant cells fall under the chemical spell of a gall-maker, there is no turning back; they will become gall tissue. Conversely, this also means that gall formation cannot occur once meristematic cells are committed to becoming "normal" plant tissue. Once leaves are produced, the leaf cells can't become gall cells. It's one reason the leaf-gall season begins in the spring! The vast majority of galls found on trees cause no appreciable harm to the overall health of their tree hosts. Keep in mind that the galls are an outward result of a complicated physiological and chemical dance between the gall-maker and the plant host. No human has managed to duplicate the work so handily done be a group of organisms that are often viewed with disdain. If not viewed with a sense of wonder and fascination, at least insect and mite gall-makers should garner begrudging respect. Imagine the plant secrets that would be unlocked if we could unlock the gall-maker's secrets?